Recap: Premier drew a highly contest match to rivals Harpos. 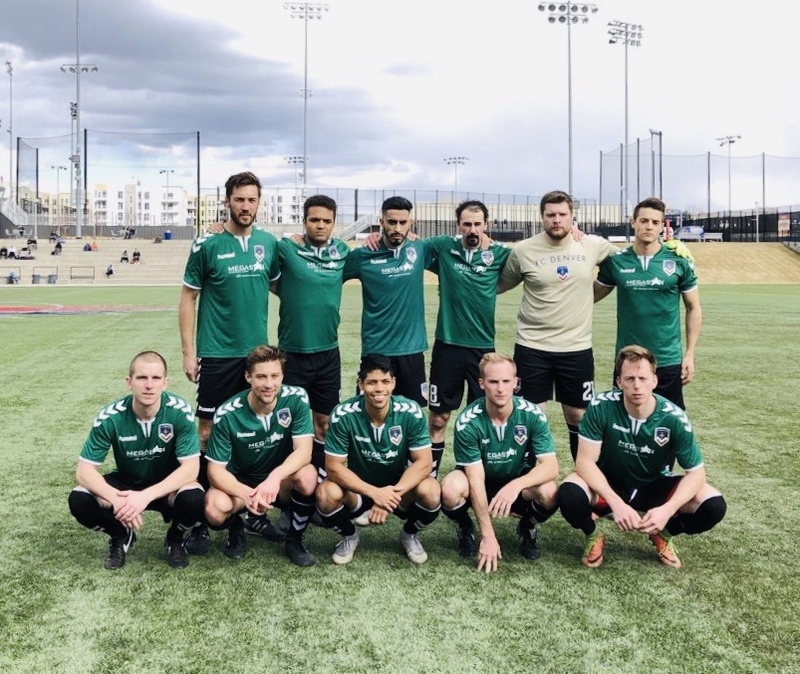 The match swayed both directions the entirety of the match, with FC Denver creating more chances. The atmosphere felt like a playoff match under the lights at our new home stadium. Having fans out, supporting both sides made the game unlike any other CPL game we’ve experienced. Next Up: Sunday, March 31st vs Union Jerez at the Regency Athletic Complex, 6pm. Recap: United played directly after Premier’s match finished at the Regency. United faced a tough AC Legends side, under the lights. AC Legends made the playoffs last season and acquired some strong new recruits in the off-season. It took us some time to find our rhythm, but we were very organized defensively. We thought outplayed them during the second half and had a couple great chances near the death. If our finishing was tidier, we could have gotten the three points. Great match. Next Up: Sunday, March 31st vs El Azul at the Regency Athletic Complex, 4:15pm. Recap: The boys played well with a pretty depleted roster, with us winding up playing the second half with no sub, as the only one that we had available, had to play full time with an injury to Ethan Boyle. A few other standouts for us were Joel Campbell who's brand new to the team, and usually and outside back, jumped into our holding mid position and held it down like an absolute rock star. Malek Asbusina also was asked to step up and play out of his normal position, fill in at outside back, and did a fantastic job dealing with their attacks. Overall, it was a great team effort to continue to find ways to break Jerez 2 down, and create opportunities for themselves. The U19's did a great job maintaining themselves throughout the 90 minutes and was a deserved win. Next Up: Sunday, March 31st vs Azteca 5280 at the Broomfield Commons, 5pm. Next Up: Sunday, March 31st vs Athletic Club Sloans Lake at the Broomfield Commons, 1pm. Recap: Legends started the season with several new faces in the lineup. We took on a much improved Rush brokers on a nice Sunny Sunday afternoon. Legends dominated possession most of the match, and moved the ball well. There were a few spells of disorganization as the new players started to gel together. The defensive back line was very strong, led by center backs Aaron Girard and Garret Taylor, limiting chances and gobbling up any free balls. Hunter Watkins had a great performance in net keeping the shutout and getting his hand on Rush's only real chance to tip a shot off the post. The midfield was dominated by Marco Delpiccolo and David Nucifora, keeping possession and building up play. Felipe led a break down the wing towards the goal and with only the keeper to beat the defender came in from behind and put it in for him. Jose scored a rip from 30 yards out to give Legends a 2-0 lead at halftime. The third goal came from nice play out the back, a gorgeous cross from outside back Charlie McDaniel breaking down the wing and a scorching header finish by Marco, goal of the match. Felipe put in one additional goal as Legends cruised to a 4-0 victory. Great early season result with the new players integrating well. Next Up: Sunday, March 31st vs Rovers Over 30 at Broomfield, 9am. Recap: After 5 weeks of preparation, the FC Denver Women's team debut was a stellar match to watch. FCD started the match playing a 4-3-3 formation, something new to several of the team members. Azteca FC, who have been playing together for 2 years, took advantage of the adjustment within the first 5 minutes and scored the first goal of the match. At the 8th minute, Joanna Aguilar served a sprinting Juliana Grover, who took the ball straight to goal, running a beat faster than the Azteca FC defender and putting the ball behind the net for the equalizer. Minute 17 out second goal scored by Christine Silvestrone, placing a perfect rebound shot hit by Juliana Grover. Although Azteca FC's keeper dove to block Juliana’s shot, she had no chance at interfering with Christine's follow-up rocket into net. Azteca FC sneaked a goal in via header tying up the score 2-2 before the half. At the 48' minute, a penalty kick was awarded to FCD. A calm and composed Sophia Centi placed the ball to the right corner of the goal as Azteca FC's goalkeeper misread the hit and dove left. FC Denver scored their first set piece goal at minute 56 to extend the lead. Juliana Grover showed up to head in a masterfully placed corner kick served by Christine. Our back line performed at their highest level, reading and interfering mostly all of the attacks. Caelynn Hirschman and Erin Hamrick were the backbone of the defense, intercepting, slide tackling, and throwing off the attacks. Our outside defenders were the wings of our team, not only pushing the ball forward and into the middle, but by preventing many of the Azteca FC outside attacks. Our goalkeeper, Marla Crum warded off 6 shots on goal, helping FC Denver clutch the win of the season opener at 4-3. Woman of the Match: Christine Silvestrone for her well-rounded performance throughout the match in both her attacking and defending duties. Next Up: Sunday, March 31st vs Denver West Lady Rebels at Highland Park, 9am.